Gambling911.com has your 2018 Winter Olympics Men's Snowboarding Slopestyle odds to win the Gold Medal. Slopestyle is a winter sport in which athletes ski or snowboard down a course including a variety of obstacles including rails, jumps and other terrain park features. Points are scored for amplitude, originality and quality of tricks. 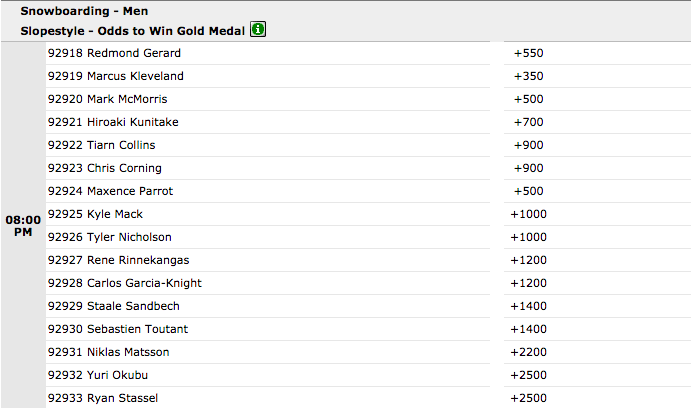 Mark McMorris has now crept into the second shortest position at 5/1 odds with Redmond Gerard at +550 now having the third shortest odds after opening as the favorite. It's now Marcus Kleveland who is the odds-on favorite at +350. McMorris is a Canadian professional snowboarder who specializes in the slopestyle and big air events. He is back after an accident last year that left him with 17 bones broken. Redmond Gerard represents Team USA. He is just 17-years-old. Norwegian Marcus Kleveland started off the winter with a pair of confidence-building wins at big air events, then went to X Games and landed a trick that had never been done in competition before: a backside quad cork 1800. He is just 18.